The breakdown of journalistic integrity due to media monopoly means that errant political activities are seldom scrutinised. The electorate may not look beyond the commercial media for their information and are hoodwinked by amoral parties of pick-pockets and conmen who tell them not to worry and that they will be looked after. It is only when it is too late that the stakeholders will realise they have been robbed. In Australia, all government agencies and statutory authorities are required to follow principles of governance and probity in their commercial dealings. "Governance" means established steps and actions, with inbuilt checks and approvals. "Probity" means the correctness of action within established moral and ethical convention. There is no exemption to this. A group or an individual in public office who ignores these principles and engages in dodgy accounting or shady legal artifices to achieve an outcome that is political, rather than in the public interest, is corrupt. In Victoria, prior to the November 2014 State Election, the Napthine Liberal Government had proposed the East-West Link — a major infrastructure project that divided public opinion. The Labor Opposition, led by (current Premier) Daniel Andrews, promised to scrap the project if elected. Notwithstanding – and while in "caretaker mode" – the Napthine Government signed a contract with an international consortium to commence the project. Not only did they sign a standard contract, it was later revealed that the Liberal Premier Denis Napthine and Treasurer Michael O'Brien had jointly entered a "side agreement" promising compensation to the consortium if the project was subsequently abandoned. No elected official – and no public servant paid from the public purse – is authorised to enter secret deals outside the guidelines of conventional contract engagement. This was a malevolent and corrupt action undertaken for political ends and was contrary to the public interest. The Liberal Party lost office in the 2014 State Election and the Labor Government of Daniel Andrews took over. They rescinded the East-West Link Project, vowing to make the process fully transparent to the public, but then reneged on this. They caved in and paid the overseas East West Connect consortium a reported $642 million in compensation. The construction consortium entered into a contract with the Victorian Government after the election had been called — and after the contesting Opposition party had publicly declared they would negate the contract if they won government. The consortium would have done their due diligence and taken out insurance to cover any commercial losses if the project was cancelled. In accepting the payment from the new Labor Government they will in all likelihood have been paid twice, for nothing delivered. This was not in the best interest of Victoria. Sadly, it is a statistical certainty that each Australian state or territory will have multiple ignominious examples of calculated politicisation of public trust and misappropriation of public funds by their elected representatives. A recent example of sly corruption in the management of public funds worthy of scrutiny is the unprecedented environmental grant made by former PM Malcolm Turnbull to an under-resourced organisation, that had not even thought to ask for it. The Great Barrier Reef Foundation board has strong ties to fossil fuel interests, it has six full-time staff, it is set up as a "charity" and its main function appears to be to reallocate money to other organisations. Its operations are not subject to environmental regulations under any state or Commonwealth legislation and if the Foundation contributes to a major environmental disaster, it can be wound up and its members (directors) are each liable to a maximum of $100 towards any outstanding obligations. The unsolicited allocation of $444 million to this shop-front venture appears to have been made without discussion, legitimate tender or evaluation. An equivalent commercial transaction of this order would be seen as aberrant, with calls for heads to roll and ensuing prison sentences. Why has there been no such outcry over former PM Turnbull’s action? If his act is seen to be merely "lowering the bar" on the probity of government spending, as some accept, Mr Turnbull has precipitated Australia towards a dishonourable place of insider dealing, favouritism and corruption. 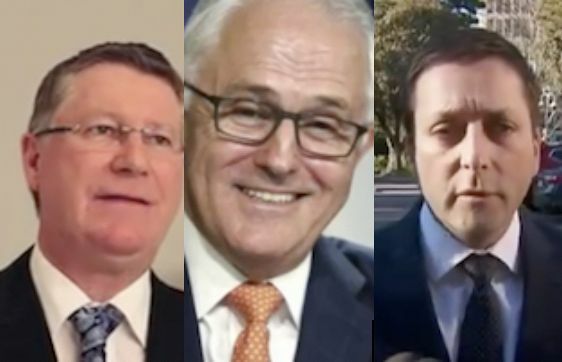 Victorian State Opposition Leader Matthew Guy is now also in the news for alleged misconduct in public office, over a well-hidden, out-of-court settlement when he was Planning Minister in the Napthine Government. On one level, we call this type of behaviour un-Australian. It is like something one might expect from a dictator strongman, Putin’s relationship with journalists or Trump’s fake news. But it is happening. The dumbing down of the media has brought about a loss of critical thinking. It is easier to let those nice people in Canberra make all our decisions for us, so the masses can chill out with the opium of more sport and titillation on our big screen internet TVs. Does it really matter that some politicians don’t seem to care about where Australia will be in five years time? That business and industry are calling for policy decisions so they can plan for the future? That the reality of man-made climate change can be an opportunity as well as a threat. That the economy can only work if it is spread around? There is ignorance and there is stupidity but corruption is an anti-social crime.